Oxford University Press has published (April 2014) The Oxford Handbook of Martin Luther’s Theology, in its series of “Handbooks” to aid study of a wide variety of subjects. Editors of this Handbook include Irene Dingel, co-director of the Leibniz-Institut für Europäische Geschichte (heading its Department of Western Church History) in Mainz, Germany, and professor of church history and history of dogma in the Evangelical Theological Faculty of the Johann Gutenberg University, Mainz; L’ubomír Batka, dean of the Lutheran theological faculty and docent of systematic theology at the Comenius University, Bratislava, Slovakia; and Robert Kolb, missions professor of systematic theology at Concordia Seminary, Saint Louis. Forty-four authors from sixteen nations contributed forty-seven essays to the 662-page volume. It contains a brief biographical introduction, followed by sections on “The Medieval Background and Origins of Luther’s Thought,” “The Hermeneutical Principles that Guided Luther’s Teaching and Preaching,” “Luther’s Treatment of the Traditional Topics of Western Christian Theology,” “Luther’s View of Sanctified Living,” “The Genre in which Luther Shaped his Theology,” and “The Impact and Reception of Luther’s Thought in History and in the Twenty-first Century.” A map of Germany in Luther’s period and a glossary of terms important in the discussion of his thought aid readers. The volume brings together three generations of scholars, those who look back on years of engagement with Reformation theology, those in mid-career whose research is poking into new corners of Luther’s massive corpus of writings, and those who are just beginning to publish results of their studies of the Wittenberg way of thinking. This, along with the spread of geographical perspectives, is designed to give readers a sense of the many conversations going on among scholars regarding the development and application of Wittenberg theology and the many perspectives from which his writings are being approached and appropriated. Copies of this Handbook may be ordered at the Oxford University Press website, www.oup.com/us. 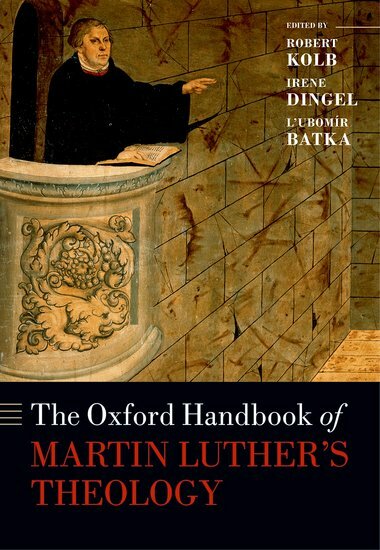 This entry was posted in News & Events, Uncategorized and tagged handbook, Martin Luther, Oxford, Robert Kolb. Bookmark the permalink.